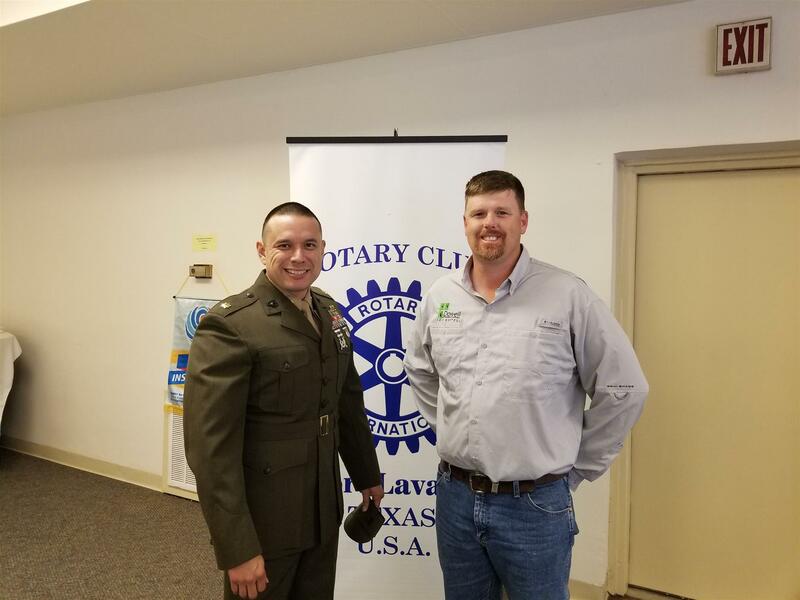 Major Felipe Rodriguez spoke to us about his experience in the armed services and his history with Rotarian Chad Dowell. Along with his brother Clint Dowell, Chad is the owner of Dowell Pest Control. Their Grandfather, Walter V. Dowell, originally founded Dowell Pest Control as Calhoun County Pest Control. After graduating from Columbus high school in 1995, Chad enlisted in the United States Navy. During his time in the Navy he made numerous deployments in support of combat operations around the world. In October of 2015, Chad retired as a Lieutenant from the United States Navy and after 20 years of service he and his family returned to their family’s home of Port Lavaca. Chad is married to Katy Dowell and they have two children, an eighteen-year old son Leo and a nine-year old daughter Delilah. Leo is currently enrolled at Blinn Jr College in College Station and Delilah is in the fourth grade at HJM Elementary School and loves to catch redfish. Chad and his family are members of Port Lavaca First Baptist Church. Major Felipe Rodriguez was born in Brownsville Texas, on February 2, 1976. He enlisted in the Marine Corps on March 11, 1996 attending Recruit Training MCRD San Diego. He was accepted in the Enlisted Commissioning Program and graduated OCS on November 30, 2007. Major Felipe Rodriguez graduated from Columbia College, earning a Bachelor of Arts Degree in Criminal Justice Administrations on March, 2002, and a Master of Business Administration from the University of Phoenix on April, 2006. He is a graduate of the Maneuver Captain Career Course, and the Operations and Tactics Instructor Officer Course. His wife Sherry Lynn Rodriguez is a North Carolina native. The Rodriguez’s have a 22 year old son, Tyler Rodriguez. Major Rodriguez’s assignments in the operating forces include: Easy Company, 2d Battalion, 2d Marines. He served as Executive Officer from Jan 2009 through May 2010 and deployed to Afghanistan in support of Operation Enduring Freedom, October 2009 to May 2010. Golf Company Commander from May 2010 to November 2010. Then assigned to Weapons Company as the Executive Officer from November 2010 to March 2012 where he deployed on the 22D Marine Expeditionary Unit from March 2011 through February 2012. Echo Company Commander, 2d Battalion 8th Marines; Aug 2015 through Jun 2017 and deployed as part of the SPMAGTF-CR-AF 16.2. He is currently the Inspector Instructor, Company Commander for Weapons Company 1st Battalion, 23d Marines. Other assignments include Company Commander for Bravo Company MCRD Parris Island. 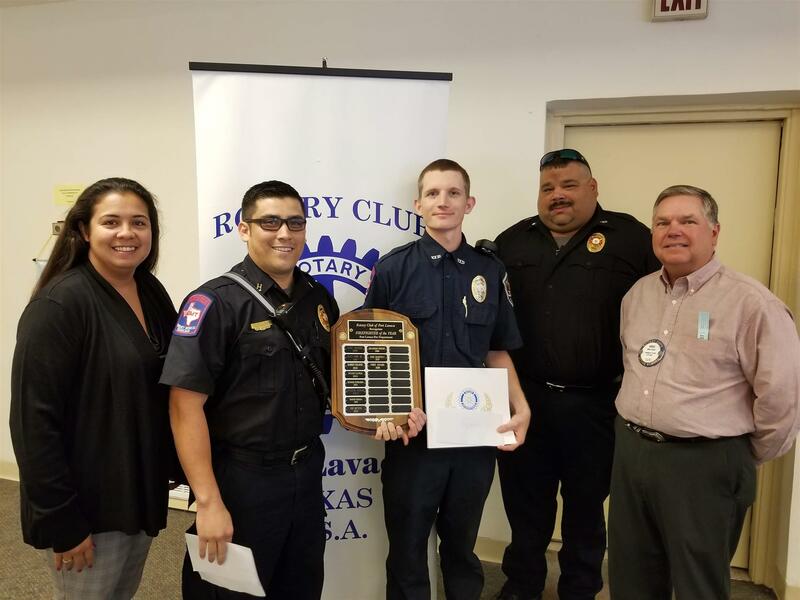 Our club also recognized our firefighter of the year.